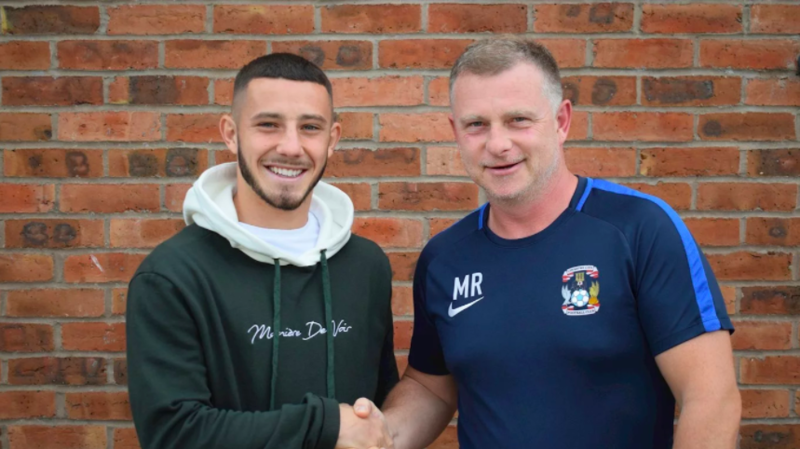 Coventry City have finally completed the signing of striker Conor Chaplin from League One side Portsmouth after a summer-long pursuit. Identified by Sky Blues’ boss Mark Robins as the number one target to replace 28-goal striker Marc McNulty who joined Championship side Reading earlier in the summer, the young forward has finally arrived at The Ricoh Arena. Chaplin initially arrives at The Ricoh Arena on loan until January, where the move will be made permanent for an undisclosed fee. Portsmouth manager Kenny Jackett had maintained all summer that Chaplin wouldn’t be allowed to leave Fratton park until a replacement had been secured, and following the loan arrival of Andre Green from Aston Villa yesterday, Jackett confirmed at his pre-match press conference this morning that Chaplin had indeed travelled to Coventry to undergo a medical. After scoring 25 goals in 122 appearances at Fratton Park, helping guide the Club to the League Two Title alongside Coventry City connections Liam O’Brien, Michael Doyle and Carl Baker, Chaplin had been identified prior to Marc McNulty’s arrival last summer. “We are delighted to have signed Conor on loan, ahead of him joining permanently. He has been our number one target during the Summer, and he has shown a clear desire to join the club too. Chaplin will wear the number 10 shirt at The Ricoh Arena, vacated by Marc McNulty’s departure.